Cleaners' basic pay will go up by $200 in the next three years, starting from next July. It will then rise yearly by 3 per cent for three years. Those employed by the same business for at least 12 months will get a yearly bonus, starting from 2020, of two weeks of basic monthly pay. The recommendations, unveiled by the Tripartite Cluster for Cleaners (TCC) yesterday, further boost the wages of some of Singapore's lowest-paid workers. Said National Trades Union Congress assistant secretary-general Zainal Sapari, who chairs TCC: "The (change) may be seen as a half-step, but (it) is a big half-step. This is the first time we are forcing an industry's annual increments, as well as some form of bonus." The Government has accepted the recommendations, which will benefit about 40,000 Singaporeans and permanent residents employed by more than 1,200 cleaning firms. Companies with service contracts that start before next July have until July 1, 2018 to comply with the recommended wages. The TCC suggestions follow its review of the progressive wage model in the cleaning industry. The model aims to raise the pay of low-wage workers through skills upgrading and improvements in productivity. It applies to the cleaning, security and landscape sectors, and became compulsory for the cleaning industry in September last year. The model specifies a starting pay of at least $1,000 a month for cleaners, with wages rising to $1,400 and more for higher-skilled cleaners, and from $1,600 for supervisors. The median basic wage of full-time cleaners grew by 9 per cent per annum from 2012 to last year. It was $1,100 in June last year. Said Mr Zainal: "We need to make employment terms and conditions better. Otherwise, the type of workers attracted to the cleaning industry will be the vulnerable ones." For eight years, assistant cleaning supervisor Leow Chin Kia's monthly pay has been stuck at $1,300. The 73-year-old was resigned to it. "I'm old already. Where else can I go? It's not enough, but I have to accept it," he said. But like other cleaners struggling to rise above their flatline salaries, Mr Leow will be assured of a pay rise in future, thanks to a raft of recommendations by the Tripartite Cluster of Cleaners (TCC) to uplift workers in the cleaning industry. It has recommended a $200 boost in basic wage levels set out in the Progressive Wage Model in the next three years. These will be raised by $60 annually in the next two years, and $80 in 2019. And from 2020 to 2022, cleaners can expect an annual increase of 3 per cent to these wage levels. 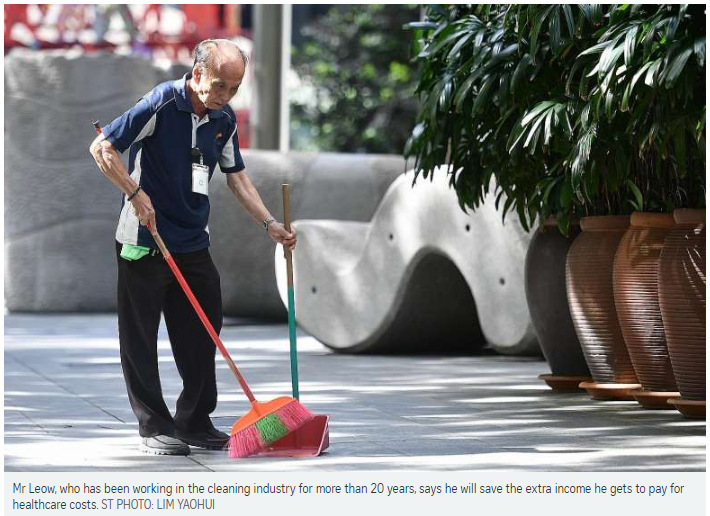 The extra income will go into his meagre savings, said Mr Leow, who has been working in the cleaning industry for more than 20 years. He cleans indoor and outdoor areas in downtown Singapore. He will get $20 more a month from July 2018, when the minimum wage level for an outdoor cleaner like him hits $1,320. The year after, his monthly salary will be $1,400. "I'm still healthy now. I still can work. But I have new problems with my body, so I need to save enough for medicine, for doctors," he said, adding that he wants to support himself in his old age so he will not be a "burden" to his family. Meanwhile, Madam Junaina Ismail - a cleaner for the past 15 years at mostly government buildings - is a victim of the wage "reset" that plagues the cleaning industry. Some cleaners find their pay and benefits, like paid leave, falling back to the minimum level when there is a change in service providers or when contracts with service buyers, like building owners, are renewed. At her previous workplace, Madam Junaina had $1,400 in monthly pay. But when she was sent to a new workplace last year, it fell to $1,000 - the minimum under the Progressive Wage Model for cleaners. The 59-year-old, who takes medicine for high blood pressure, said the new pay levels will help ease her concerns in the coming years. The annual bonus from 2020 - her first in almost a decade - is the icing on the cake. "I was worried because everyone kept telling me the economy was bad. But now, every year, there's something to look forward to: Even $60 is enough, for groceries, for little things," she said. National Trades Union Congress (NTUC) assistant secretary-general Zainal Sapari, who chairs TCC, hopes the pay rises will help improve the image of cleaning, a job shunned by many in an industry staffed mostly by elderly workers. "If you want to make cleaning a viable industry to attract people, you have to improve the employment terms and conditions. If the job doesn't give annual increases, doesn't give bonuses, it will not be attractive," he said. "We hope it will attract even younger workers to become cleaners." TCC and NTUC said in a joint statement that the new pay levels will benefit all: Cleaners will get sustained wage growth and progress in their careers, businesses can better attract and retain quality workers and be more motivated to invest in their training, and service buyers will benefit from more reliable and better-quality cleaning services. Service providers and businesses that hire them agree, saying it is time to take a long-term perspective of where the industry is going. Said City Developments' group general manager Chia Ngiang Hong: "As buyers of cleaning services, we play a key role in supporting this effort through our procurement practices." Mr Milton Ng, president of the Environmental Management Association of Singapore, which represents cleaning firms, said higher pay will help draw people into the industry. "Hygiene is also important in our daily life, but we take these hygiene workers for granted. We have a moral obligation to make sure that this group is taken care of," he added. The move yesterday to come up with a pay structure with steady increments for cleaners is not entirely new. Over the past few years, cleaners have seen their pay go up. As of June last year, they were earning a basic median salary of $1,100 a month, compared with about $800 just four years ago. This was the result of a recommendation by a national committee of unionists, employers and civil servants in 2012 to set a minimum salary for local cleaners: Those cleaning offices will get at least $1,000 a month in basic pay and those cleaning hawker centres will get $1,200 a month. A new law that kicked in from September last year also made it compulsory for cleaning companies to implement the minimum wages. What is novel this time is that the national committee, having set the minimum salaries, is pushing for pay hikes for cleaners over the next six years. According to the committee's plan, a cleaner earning the floor of $1,000 a month will see his salary go up to $1,200 in 2019 and $1,312 in 2022. In an unprecedented move, the Government has accepted the plan. This is despite the fact that it goes against longstanding principles of linking pay hikes to productivity, and keeping the labour market flexible by having market forces set salaries. The one plausible explanation: The move is necessary to prevent cleaners' salaries from stagnating again. For 10 long years, between 2001 and 2010, the wages of cleaners had been depressed. This was the decade which saw an influx of foreign workers doing low-wage jobs, which, in turn, depressed wages, and cleaners were particularly vulnerable as they were mostly older, less-educated workers who did not have many other job options. While income figures for cleaners were not officially released, it is clear they earned well below the lowest quintile of workers. During that period, the nominal monthly income of the lowest quintile rose from $1,200 to $1,400. This increase worked out to real growth of only 0.3 per cent, almost flat, after adjusting for inflation. The wage-hike plan can prevent a repeat of this wage depression. What is also encouraging is that it has the backing of cleaning service buyers, including big names such as home-grown CapitaLand and City Developments, which were in the committee that drew up the plan. One would have thought these property giants would resist the move, since raising cleaners' pay will increase their costs, but they did not. This is a welcome acknowledgement that padding profits by depressing the wages of local workers is not the way to go. 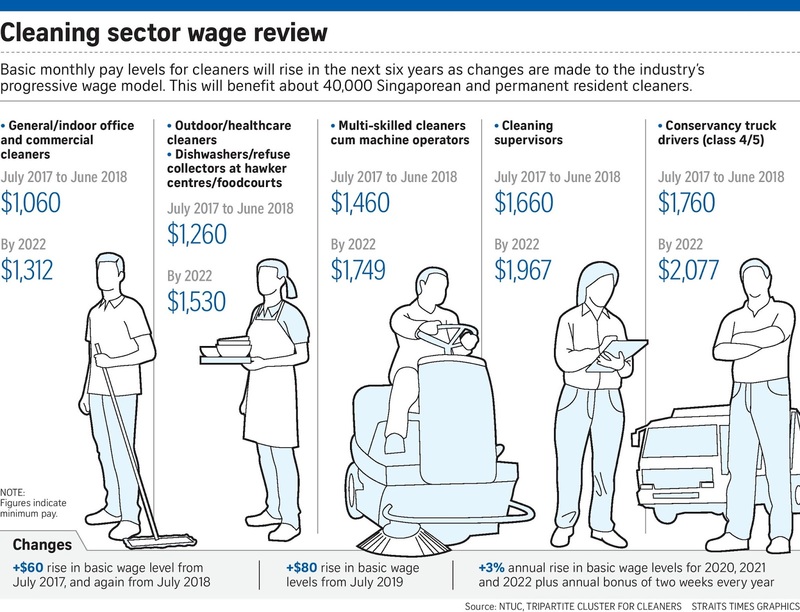 While about 40,000 local cleaners are set to benefit from the pay hike, they will still earn considerably less than most workers in Singapore. The median monthly pay of local full-time workers, including employer contributions to the Central Provident Fund, was $4,056 in June. But before one dismisses the pay hike as minuscule, it is necessary to look at other help the Government is giving low-wage workers. For instance, those who qualify for Workfare will get larger and more frequent payouts starting from next year. The income ceiling for the Workfare Income Supplement scheme, which targets the lowest-earning 30 per cent of the citizen workforce, is also being raised from $1,900 a month to $2,000 from next month. The extension of MediShield Life to cover pre-existing illnesses and the higher premium subsidies for low-income citizens will also help them with healthcare costs. If the Government can keep a lid on inflation, cleaners and other low-wage workers will not see their earnings eroded by higher prices of daily necessities. In a nutshell, the wage-hike plan for cleaners goes way further than the wage-hike recommendations the National Wages Council made in the past. The six-year timetable sends a clear signal to cleaners that the Government wants to increase their salaries in a sustainable way. The move could even benefit other low-wage workers, since it will put pressure on two other low-wage sectors that hire locals - security and landscaping - to do the same. These sectors have also implemented compulsory wage ladders, or what the labour movement calls the Progressive Wage Model. It remains to be seen whether they will get similar long-term wage-hike plans like the cleaning sector. For cleaners, though, the move will definitely bring cheer, not just for this festive season but for six more years after that. Foreign visitors often comment on how clean Singapore is, perhaps not appreciating that there is an army of cleaners who make it that way. These workers do a necessary job that most people don't want to do, yet they are among the most poorly paid in the country. Moves to raise the basic pay of local cleaners ("Steps to hike pay for 40,000 cleaners unveiled"; Dec 13) are therefore welcome. However, a thought should also be spared for the migrant workers who make up a significant proportion of Singapore's cleaners and who are not covered by the recommendations of the Tripartite Cluster for Cleaners. Many work long hours and still receive significantly less pay than what most local cleaners receive in a normal working week. Bangladeshi cleaning workers are generally paid between $500 and $800 a month and work 12-hour days, whereas the current target for basic pay for a local worker is at least $1,000 a month for a standard working week, although they perform similar work. Isn't it time a determined effort was made to raise the pay of these low-paid workers, too? The Tripartite Cluster for Cleaners (TCC) recognises that employers, when hiring foreign workers, have to bear other manpower-related costs such as the foreign worker levy and accommodation costs ("Consider raising pay of foreign cleaners, too" by Transient Workers Count Too; Dec 16). For this reason, the TCC has recommended that the specific wage levels of the Progressive Wage Model apply only to resident cleaners. However, the TCC recommendations state that employers should also endeavour to incorporate the key principles of progressive wages, such as salary progression, skills upgrading, productivity improvements and career advancement, into the wage structure of their foreign cleaners. Very importantly, we urge the industry to practise best sourcing to ensure that our cleaners are paid fairly based on quality of service. Madam Wong Kim Fong, 73, is marking her 55th year as a housekeeper at Mount Alvernia Hospital - her first and only job, and it is likely to be her last. The senior housekeeper, who has spent more than half a century cleaning the private hospital in Thomson Road, is its longest-serving staff member. Her late father was a cook at the hospital, which was set up in 1961, and he recommended his then 19-year-old daughter as a housekeeper in 1962. Madam Wong, who has primary school education, said: "I never thought of looking for another job as the staff here are good. And I'm so used to working here." She and three other housekeepers - who have each worked at the hospital for 45 years - are a rarity in today's job market, where change is relentless and disruption the new reality. This is especially so for the cleaning industry, in which a cleaner who stays with the same firm for 10 years is deemed extraordinary, said Mr Milton Ng, president of the Environmental Management Association of Singapore. ISS Facility Services managing director Woon Chiap Chan said about a third of its new cleaners do not stay for more than a year. ISS Facility Services, which is one of Singapore's biggest cleaning firms, employs some 6,000 cleaners. One reason for the turnover is that many cleaners want to work in the same office but their employer may not win the tender when the cleaning contract is up, so they move to the cleaning firm that wins the tender. Older Singaporeans new to the cleaning sector may also quit when they find themselves unable to cope with its demands. Given the low base pay for cleaners, people will move quickly once there is an increment offered elsewhere. Mr Ng said: "People, especially the younger staff, jump ship for $50 more a month." Most cleaners here are hired by cleaning firms, Mr Woon pointed out - unlike Madam Wong and her colleagues, who are employed directly by Mount Alvernia. Two other housekeepers who have worked at the hospital for 45 years said the generous benefits and good working relations are key to their job longevity. Madam Lim Ah Bee, 67, said of her colleagues: "We have known each other for so long, we are like family. This is like my second home." For Madam Tan Kim Yeok, 65, the staff benefits are a big pull. For example, staff can claim up to $1,000 a year for their medical bills. And owing to her long service, she gets 21 days of annual leave. Madam Wong started work with a monthly salary of $90 in 1962 but now takes home $1,888 a month after Central Provident Fund deductions. Both Madam Tan and Madam Lim earn $1,500 a month. These salaries and benefits are generous by industry standards. The median basic wage of Singapore's full-time cleaners was $1,100 in 2015. Mr Woon said cleaning firms usually give cleaners between seven and 14 days of leave a year. He added that after working for 30 to 40 years, cleaners still earn less than $2,000 a month. Their low wages are the reason the labour movement's Tripartite Cluster for Cleaners has pushed for higher pay. From July this year, the basic pay of cleaners hired by cleaning firms will rise by $200 over three years. After that, it will rise yearly by 3 per cent for three years. The Mount Alvernia housekeepers plan to work for as long as they can. They work six days a week, for eight hours a shift. Madam Wong's husband, retired technician Loy Jit Tuen, 73, said: "I have told her to retire but she wants to work. We don't need the money. We have savings." The couple have two daughters and four grandchildren. Their elder daughter, 44, works in a university, while their younger daughter, 40, is a nurse. In the past 50 years, Madam Wong has hardly taken medical leave. All the "exercise" involved in cleaning keeps her fit, she said. Mr Zukifli Abdul Rashid Durai, assistant manager of housekeeping, said: "If she has a cold or is sick, she would still come to work. We have to force her to go home to rest. She's very responsible and hardworking." The housekeepers said cleaning methods and materials have changed over the decades. For example, in the 1960s and 1970s, they had to go on their knees to scrub the floor. Now, they handle a machine that does the scrubbing, which is less tiring for them. Back then, they used soap and water to scrub the floor. Now there are chemicals to make the job easier. Mr Zukifli said of the veteran housekeepers: "They are a dying breed in terms of loyalty. You don't see people working with the same company for 50 years any more." Cleaners are a part of Singapore's invisible economy. They toil anonymously to ensure the cleanliness of roads, hawker centres, food courts and offices which Singaporeans take for granted every day. This, though, is a strong reason for keeping the economic fate of cleaners clearly in the public view. These low-wage earners must not be consigned to a resigned fatalism born of the belief that other Singaporeans, led by the Government and trade unions, are impervious to their fortunes. On the contrary, a measured display of labour activism has resulted in the good news that the basic pay of cleaners will go up by $200 in the next three years, beginning next July. It will then rise annually by 3 per cent for three years. Also, those employed by the same business for at least 12 months will receive a yearly bonus, beginning in 2020, of two weeks of basic monthly pay. These benefits are the result of the Government having accepted the recommendations of the Tripartite Cluster for Cleaners (TCC). Given the modest amounts involved, it would be tempting to dismiss the result. However, to do so would be to forget the marked improvement which it constitutes over the time, just four years ago, when market forces determined that the basic median salary of cleaners would be a mere $800 a month. In June last year, cleaners already were enjoying a monthly salary of $1,100. That change had required the intervention of a national committee of unionists, employers and civil servants in 2012 to set a minimum salary for local cleaners. The wage increase was not inconsiderable for workers stuck in a job that few cared for, because fewer wanted it. The panel proved that official intervention could, and did, form the vanguard of economic change. The TCC chairman, National Trades Union Congress (NTUC) assistant secretary-general Zainal Sapari, placed the latest news in perspective when he said that the change could be seen as a half-step, but it was a "big half-step". That is because this was the first time "we are forcing an industry's annual increments, as well as some form of bonus". That assertion would be received well by workers in two other low-wage sectors that hire locals: security and landscaping. Their daily contributions, too, must not be forgotten in clean, green and secure Singapore. The larger point is the importance of incremental but continual advances in labour interests in a country that prizes economic development and industrial harmony. Singapore's tripartite system is built on the ultimate sense of trust that workers place on the state's ability to hold the ring between the profit imperative of capital and the needs of labour. It is commendable that service providers and businesses that hire them agreed with the labour movement's concern for cleaners. In turn, they will be better motivated. This is how tripartism should work: for the benefit of all. Is Singapore the new sick man of Asia?